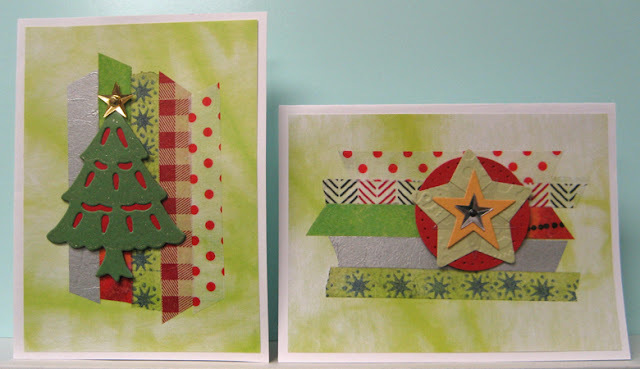 I am working through the backgrounds I created using decorative paper and washi tape to make sets of cards for gift giving. You can check out the first set I made here. For these cards I used a off white and green decorative scrapbook paper that has a somewhat watercolour/tie dyed look. I trimmed the paper to fit on my off white cards (just a bit smaller than A2), glued all my backgrounds to my cards before getting started on my embellishments. 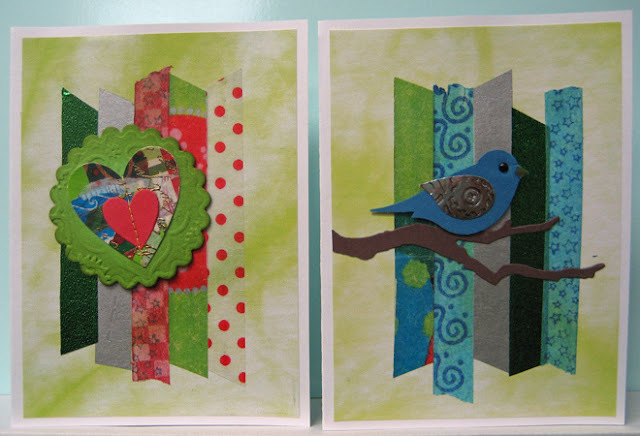 For my first card, I took inspiration from my other set and created a layered heart embellishment. I used a serendipity heart die cut which I found in my stash, layered on a tiny red heart die cut and then machine stitched them together using yellow thread gluing the thread ends to the back with regular tape. I dug through my stash and found a green die cut scalloped circle which was sponged around the edges which coordinated nicely. I manually embossed some texture using an element from one of my floral embossing folders and then mounted my heart element to it with double sided tape. I mounted my heart focal element to my card front using 3D foam tape. For my second card, I die cut part of this bare tree (TH) from brown cardstock and mounted it to my layered card front. I punched the bird (SU) from blue cardstock, coloured in the beak and added a tiny black brad to create the eye. I punched the wing from shiny silver card and manually embossed it with a round element before mounting it to my bird using double sided tape. I mounted the bird just touching the branch using 3D foam tape. For my third card, I thought I would give a nod to Christmas and created a little tree embellishment. I dug the green tree from my stash (a die cut shared by a friend) added a triangle of red in behind which shows through all the opening and added the gold sequin star using a tiny gold brad. It still needed a bit of something so I used a clear glitter gel pen and highlighted all the scallops and added dots all over the tree. Once finished I mounted my little tree embellishment to my card front using 3D foam tape. For my fourth card I created a star embellishment by layering a silver sequin over, a yellow star die cut, over a clear star die cut over a manually embossed light green star die cut and holding them all together with a tiny black brad. I layered my star onto a red circle punchie and then paper pierced around the edge with a push pin before mounting this focal element to my layered card front. This process has been very enjoyable!! Looking forward to working on the other sets! !